I am still making a lot of Christmas cards. This time I have used some old watercolour paintings that were rubbish and then stamped on them and used my custom cutting set to cut out the images. I am quite pleased with the results. 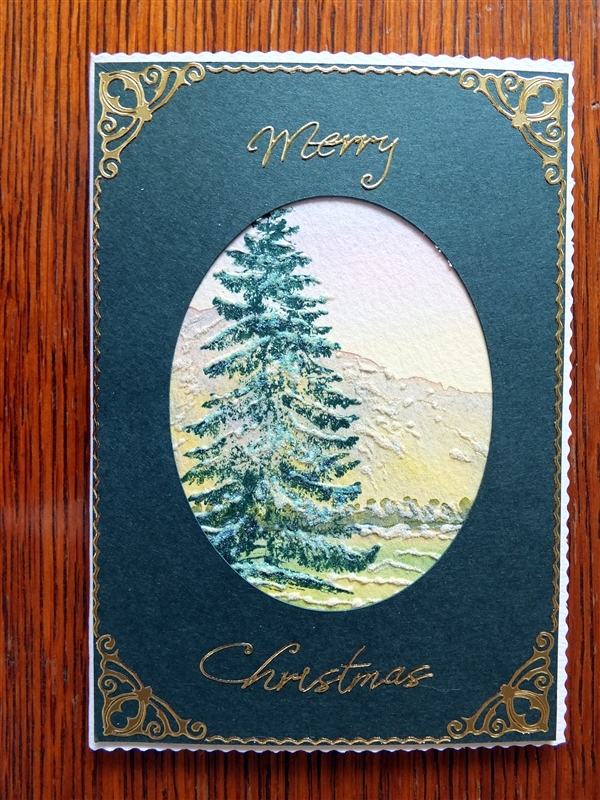 For this card I have used a landscape painting with hills and far trees and stamped my tree on the top. For the snow effect I have used Liquid Applique and dusted this with fine glitter for a touch of sparkle. I then cut out an oval of dark green card and placed it over my image. I then used Peelcraft stickers for the corners and edges. This another card using a watercolour background. This one used a plain sky background that I had painted years ago. I have used the Liquid Applique and glitter again to create the snow effect. My custom cutting system is great for cutting out the matted image as well as cutting out the green card in the foreground. 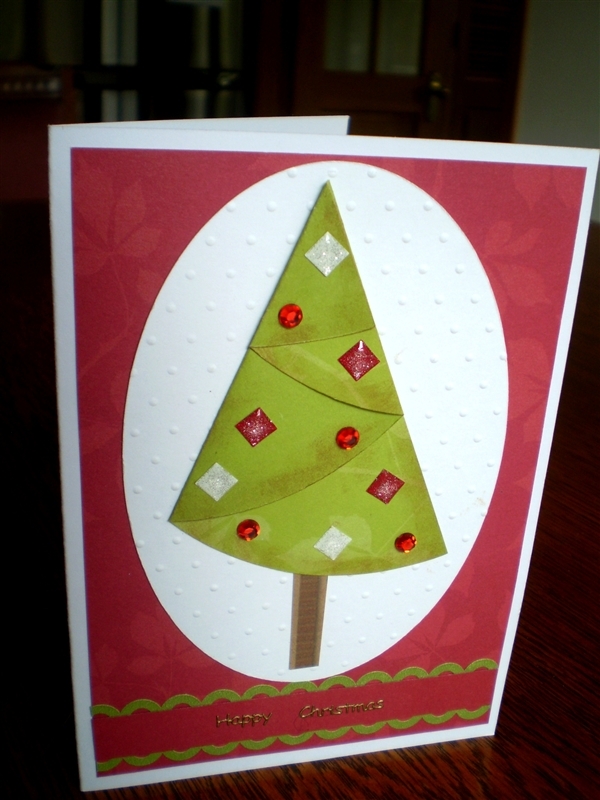 A Peelcraft Christmas greeting finishes off this card. 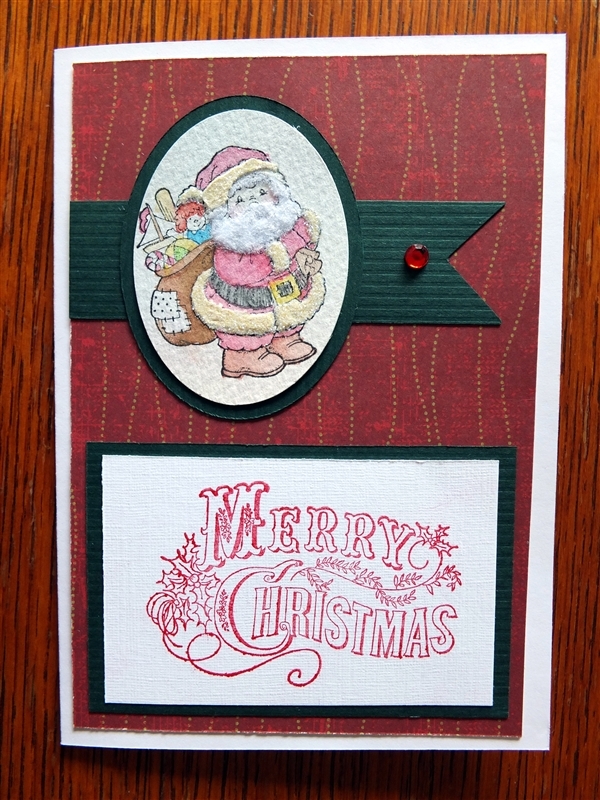 For this card I have stamped a Santa image onto a plain slightly watercoloured background. I painted the Santa image with my watercolour paints. The Santa beard has had flock applied for a fluffy effect and for the trim on the coat and hat I have used Liquid Applique and glitter. 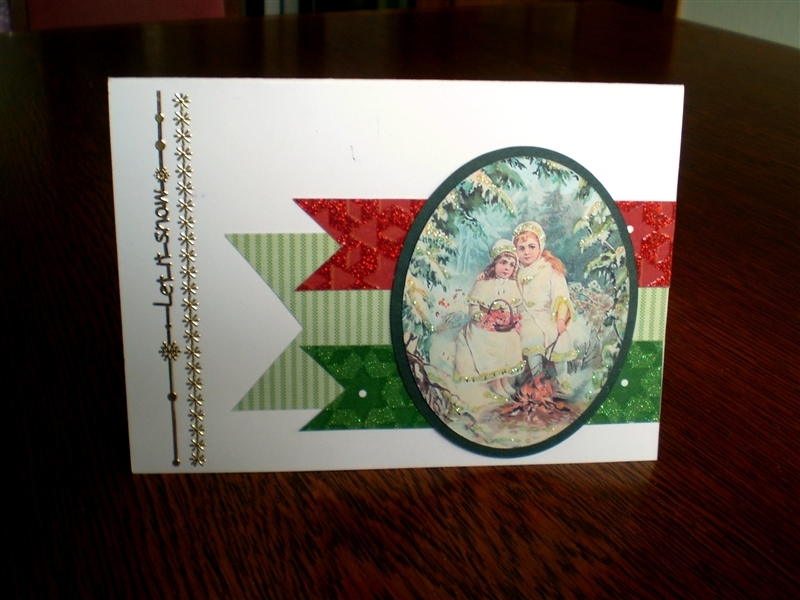 I have used a combination of red and green scraps for the background, matted greeting and the ribbon. The touch of bling is from the Enchanted epoxy stickers. 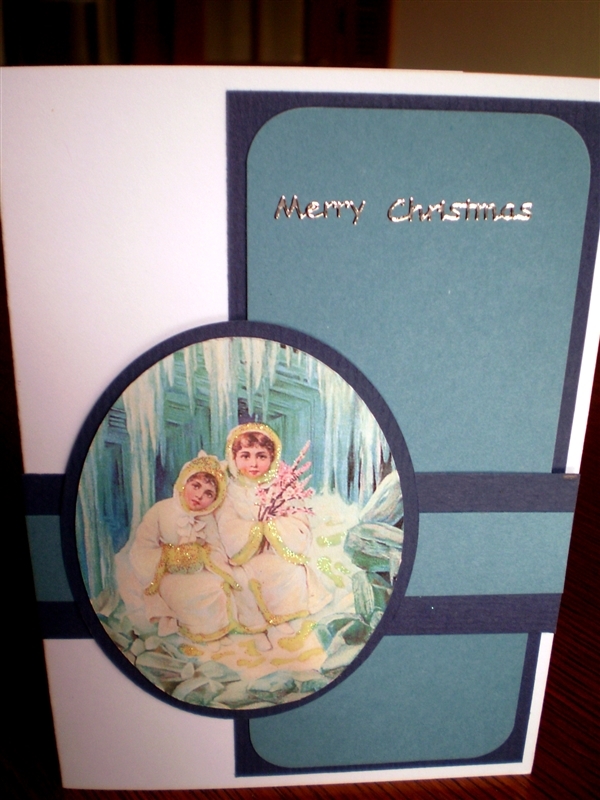 This card has another stamped image on a lightly coloured watercolour background. I have painted the stamp with my watercolours and then I have matted it on a green card using my custom cutting system. The base of the image needed to be covered hence I have placed the band across the card. For the grey card I have used my zigzig blade on my rotary trimmer for the fancy edge. I then placed the blue card on top and finished with a strip of green ribbon from the Noel range of products from Creative Memories. I have put three stickers from the Enchanted epoxy stickers on the ribbon. Finally I placed a Peelcraft sticker onto the card. 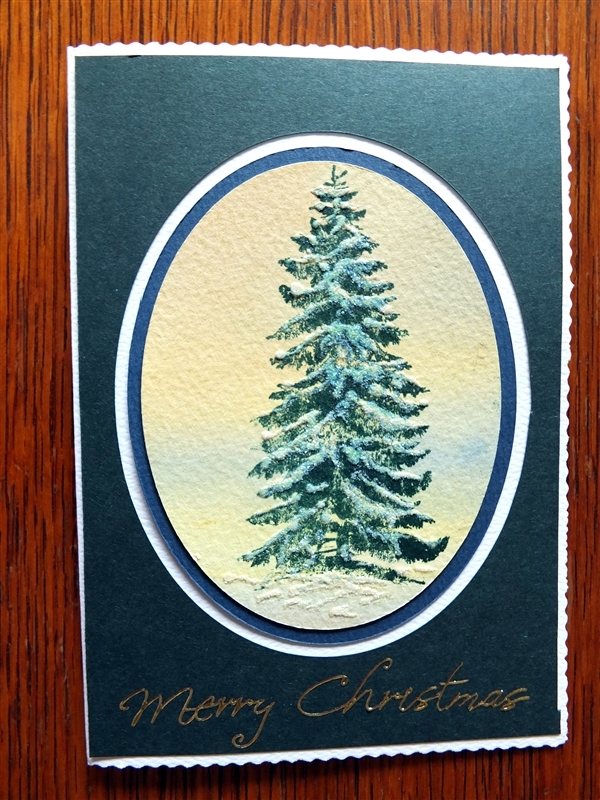 This rather simple card also has another tree stamped onto a watercolour background. I managed to get some hills in the background to create some depth to the image. 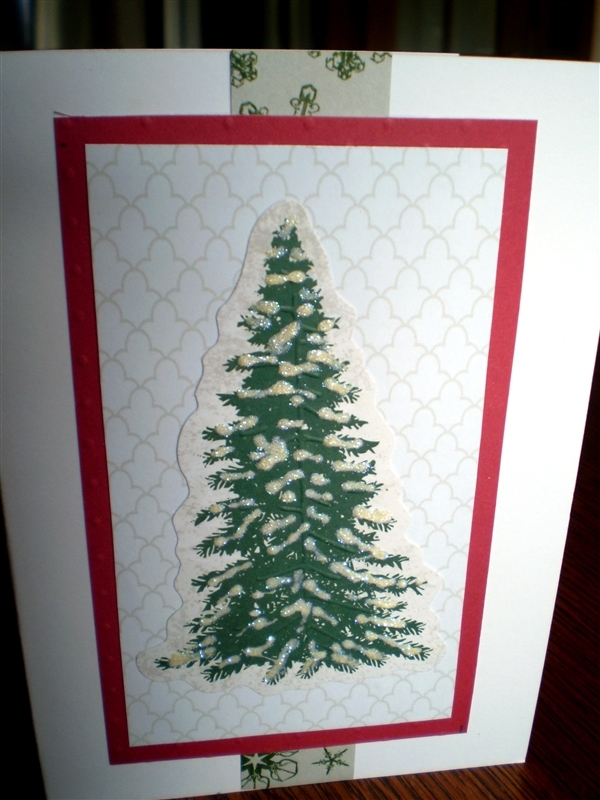 Once again I have used the Liquid Applique and glitter to create snow on the tree. 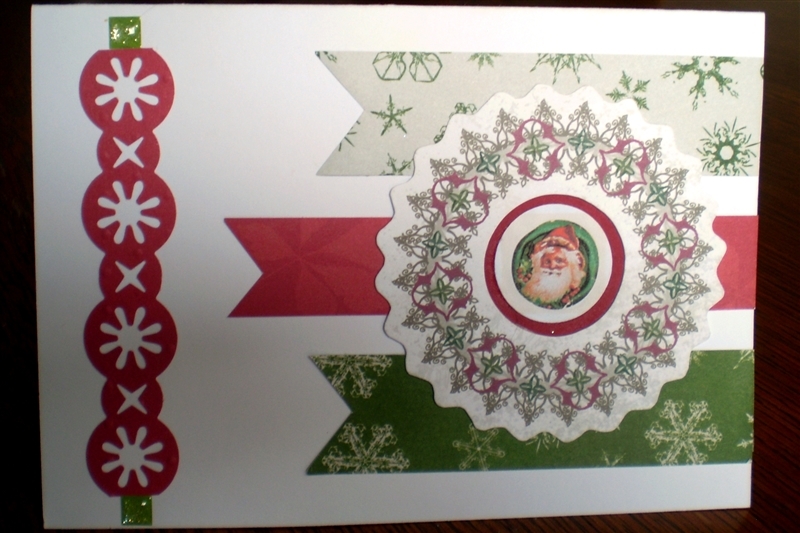 This time I have stamped Merry Christmas onto the image and then cut it out using my custom cutting system. I used a scrap of green patterned paper for the background and then finished of with a strip of ribbon from the Noel range (which sadly is being discontinued, but the new range of Nordic and Be Merry is just as good) with some bling from the Enchanted epoxy stickers. I love the blue and grey tones on this card. I have stamped the tree with blue (actually it was not meant to happen but still turned out great) ink onto a lovely watercolour hill paper. Unfortunately, I didn’t manage to stamp it evenly so covered the blank areas with the stamp of Peace and a flower from the Reminisce range from CM and with a black sticker from the Enchanted epoxy range. I then cut out the image and matted it with blue card using the custom cutting system. The lacey edge is made from using a punch from Fiskers and layed using a lovely cream metallic paper and a silver grey card that I had in my scrap drawer. 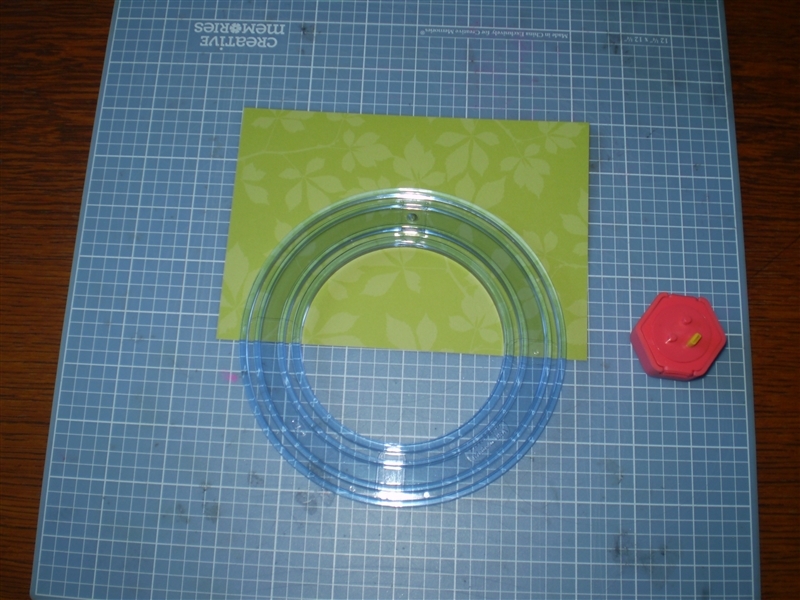 I then cut a piece of the same blue card approximately 1 inch in diameter and topped it off with a piece of the metallic paper using the deckle blade on my rotary trimmer. 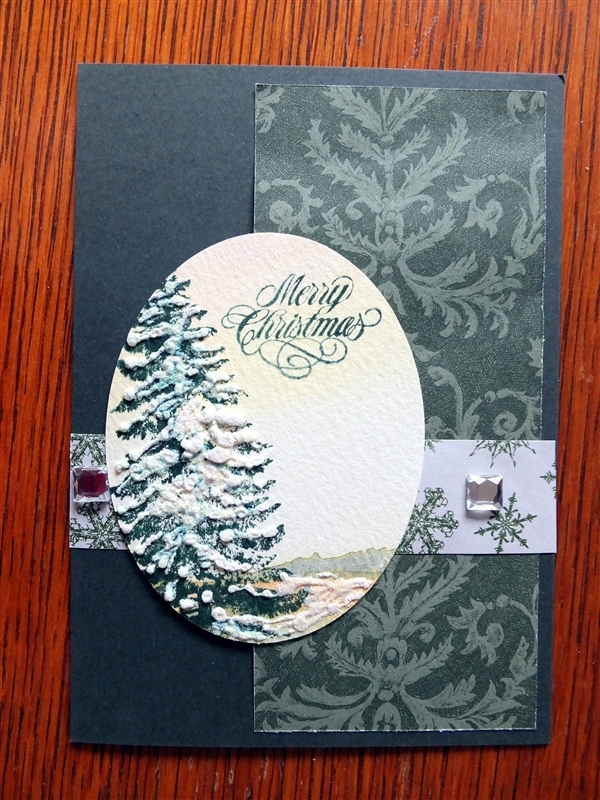 To finish of I have stamped the greeting and then placed some Kaisercraft blue rhinestones. Happy crafting and catch you again soon. Today I will be showing you how to make the Christmas tree. As you can see it is very easy to do. I have used the Enchanted range as the colours are great for Christmas. First cut a 5 inch half circle. 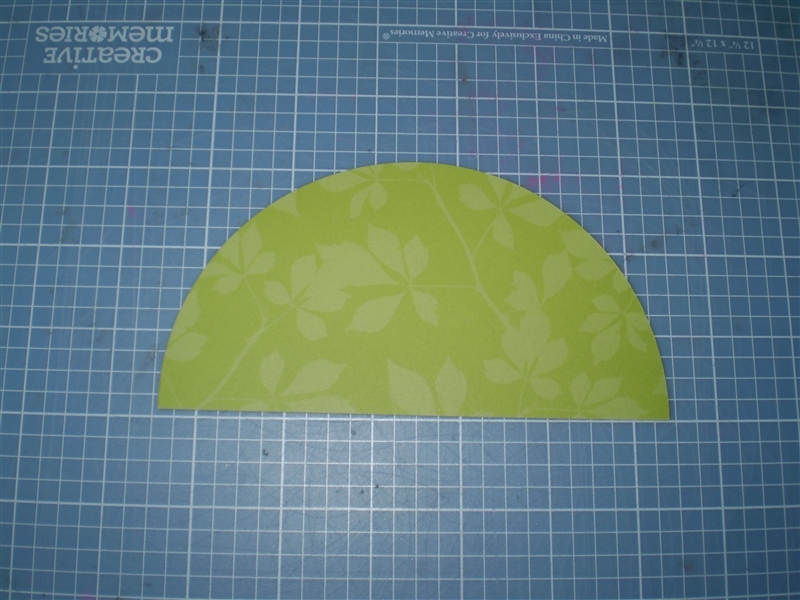 I have used the Creative Memories Custom Cutting large circle and the red cutter to create the shape. All cut out and ready to fold. I then used my rotary trimmer to score a line about 1 1/4 inches from the edge of the paper. The first fold in toward the middle. I then folded the paper along that line. 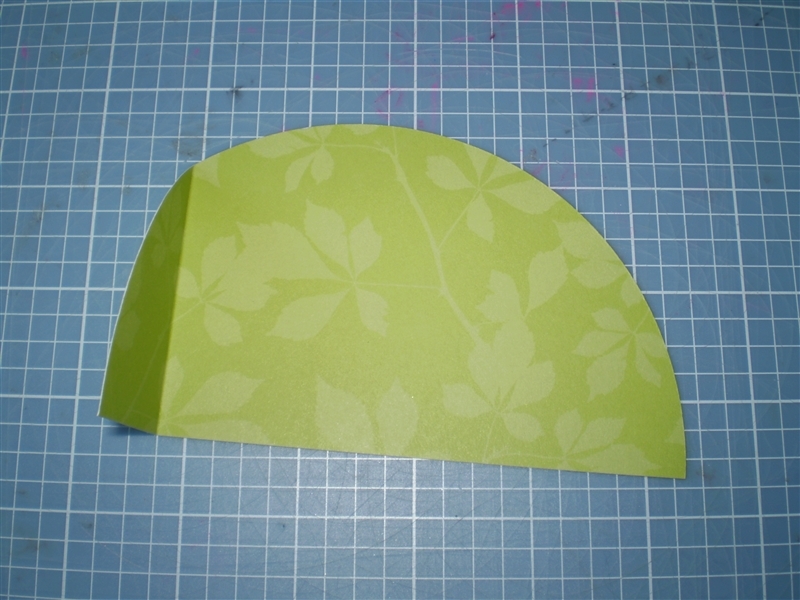 Fold the corner of the paper up to align with the folded edge. 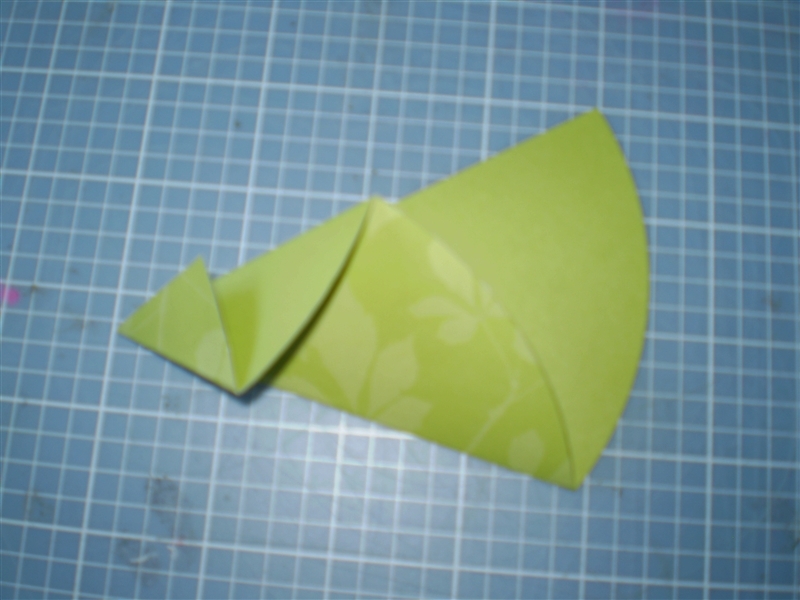 Then fold the card back along the shorter edge towards the back and in this photo you can just see the fold that I have made. Turn over the paper and there you have the finished tree to embellish as you would like. To finish off I sponged the edge of the tree with a brown ink pad and then used the Enchanted epoxy stickers to add a little bling. 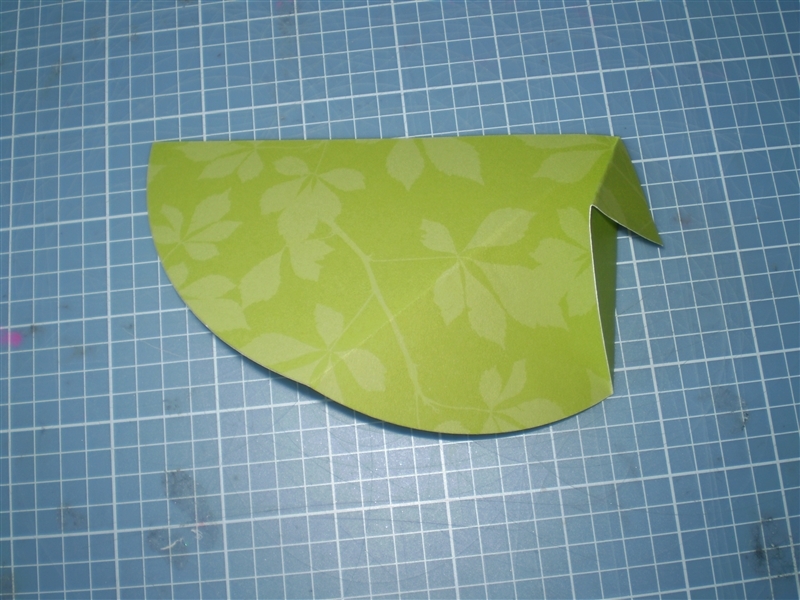 You can also cut a piece of brown card or paper to make the base of the tree. I hope you have fun with this. This is a great project for children to do to make their own cards and I will be doing this at my local library on Christmas Eve for their holiday programme. 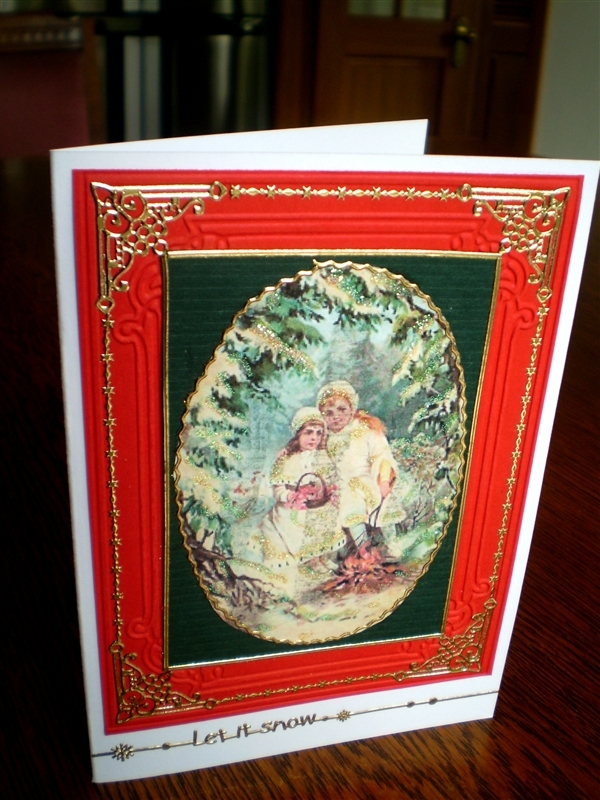 Well it is that time of the year and I have started on making Christmas cards. Most of my cards have been created using CM products, but I have also used other scraps that I have had in my scrap drawer. 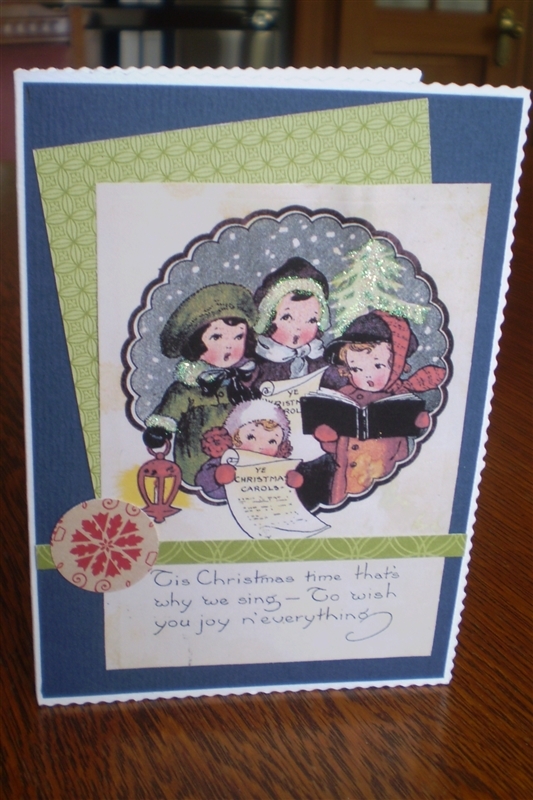 I have also got a book out of the library with old fashioned images which makes lovely vintage type cards. All these images are copyright free which is even better. 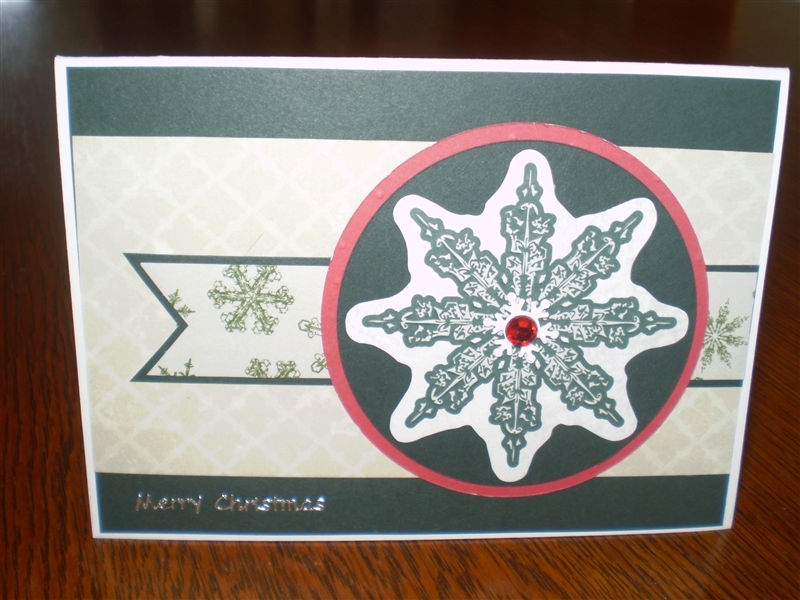 This card has been created using CM Noel papers and a die cut. I have also used the red Enchanted ribbon which goes really well with the Noel range. The stamp is from Rubbadubbadoo. This is one of the images from the library book. I have put a little glitter on the snow in the image. I have used my CM custom cutting system ovals to create the matted image. I have finished off with a Peelcraft Christmas greeting. I have printed off an Enchanted paper from Storybook Creator for the background. 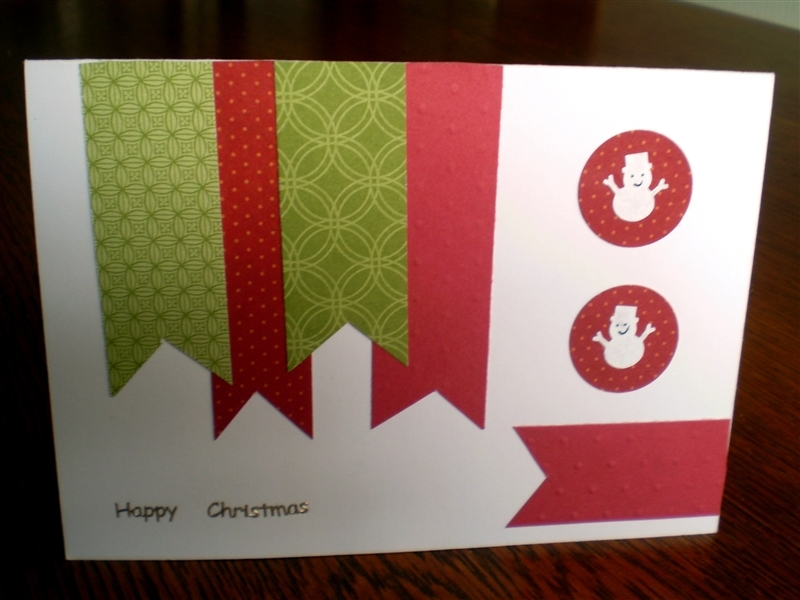 The ribbon in the background and the die cut is from the Noel range of papers. I have used white liquid applique and shook some glitter over the top to create a snow effect. Noel ribbons have been used here and a Noel die cut with a Santa also printed from my Storybook Creator placed in the centre. The strip on the left has been created using my CM border system twinkle chain cartridge out of Enchanted embossed paper. Finished off with a couple of Enchanted embellishments. Once again I have used a combination of Enchanted papers and Noel ribbon and die cuts. I have printed off an image from my Storybook Creator and backed it onto a piece of scrap paper that I had in my scrap drawer. I love the colours in this card. This Christmas tree is a very popular image on Pinterest and is so easy to do. I have used a 5 inch circle of paper and then cut that in half. I scored about 1.25 inches along from the edge and then folded it back. 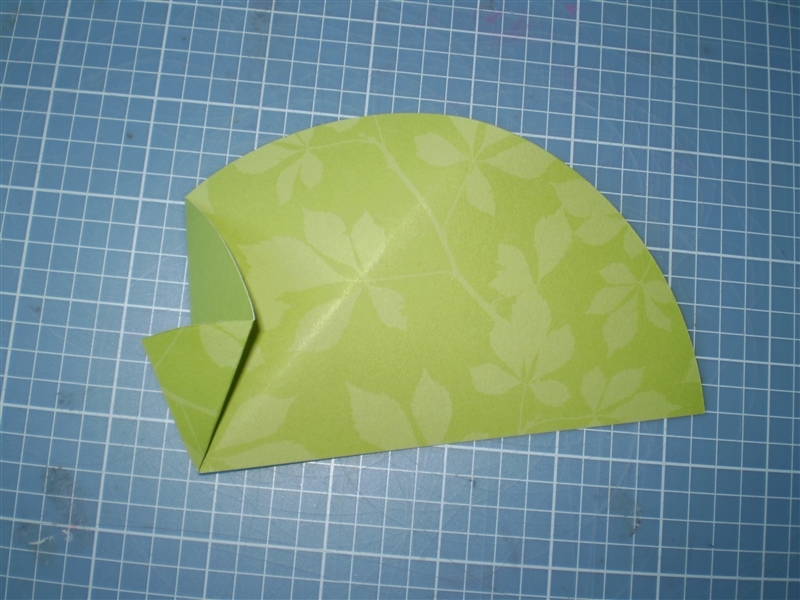 I then folded that fold onto the edge and then back onto itself. Sorry about the confusing instructions but there are very good videos on You Tube. Here I have used the Enchanted bling for the tree decorations, and Enchanted papers for the background. I love these colours for Christmas cards and the Enchanted embossed papers mean I don’t have to use an embossing folder to create the dots on the white oval. 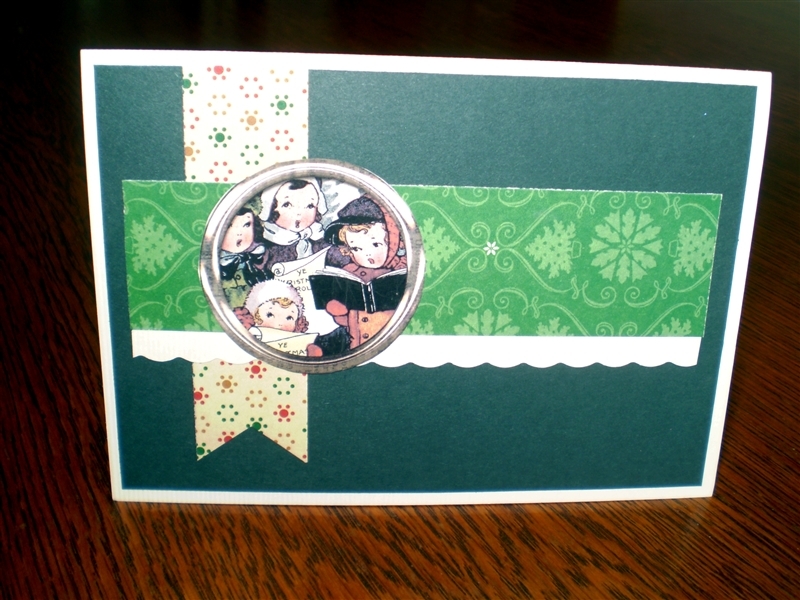 The green Enchanted ribbon makes a nice edging when a piece of card is placed on top. 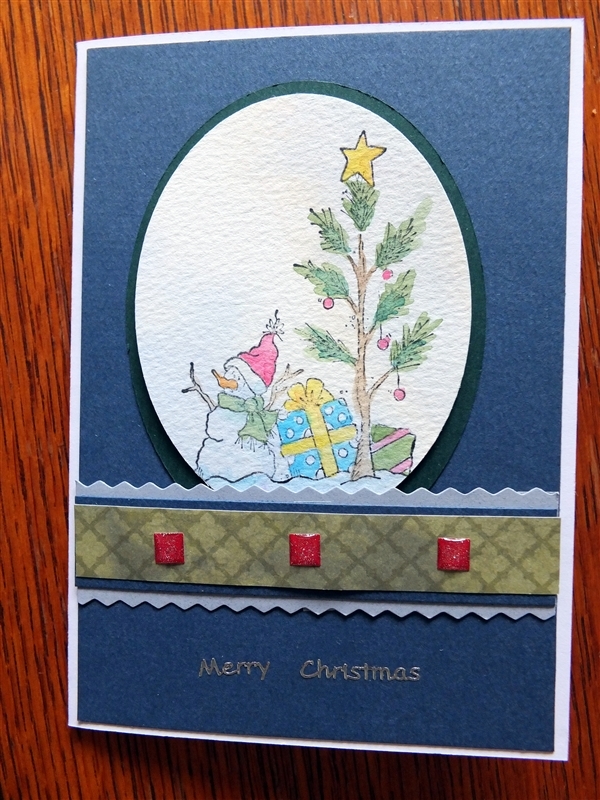 In this card I have used some scraps for the ribbons. I have used my Snowman punch and put them on the circles. Peelcraft greeting finishes this off. 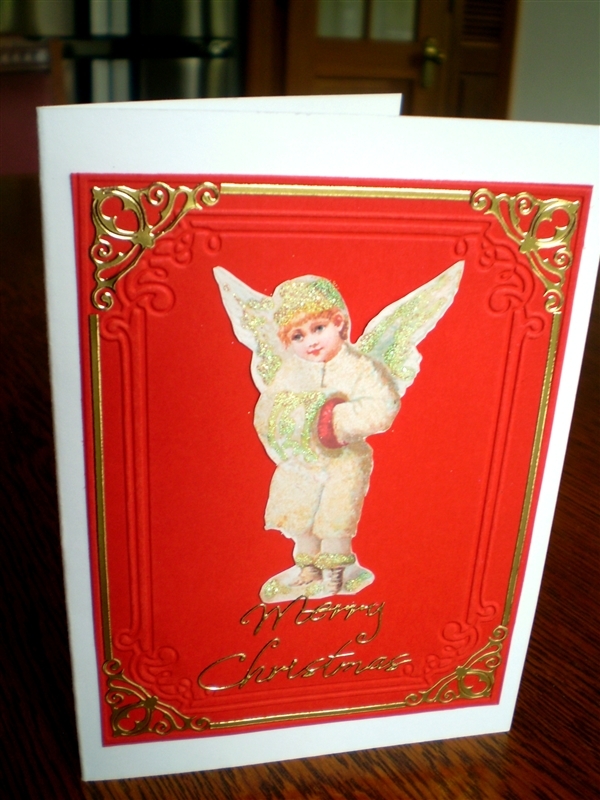 This angel is another image from my library book and has been placed on an embossed red card and finished off with Peelcraft corners, lines and greeting. Glitter glue has been used to highlight the wings and snow. Similar card to the last one with another image from the lovely library book. I have highlighted the snow with glitter glue. 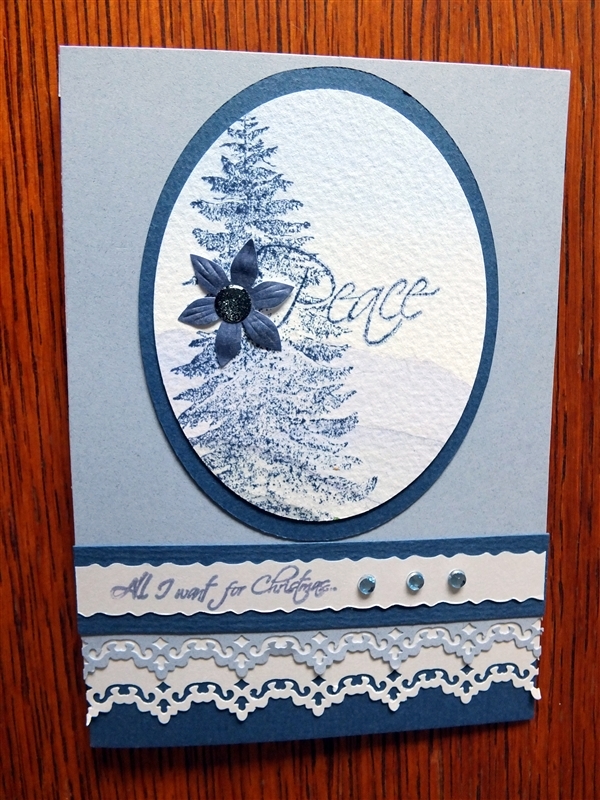 This card is made from Noel papers and a die cut with a Peelcraft greeting. Another ‘scrappy’ card from scrap drawer and again the lovely image from the library book. 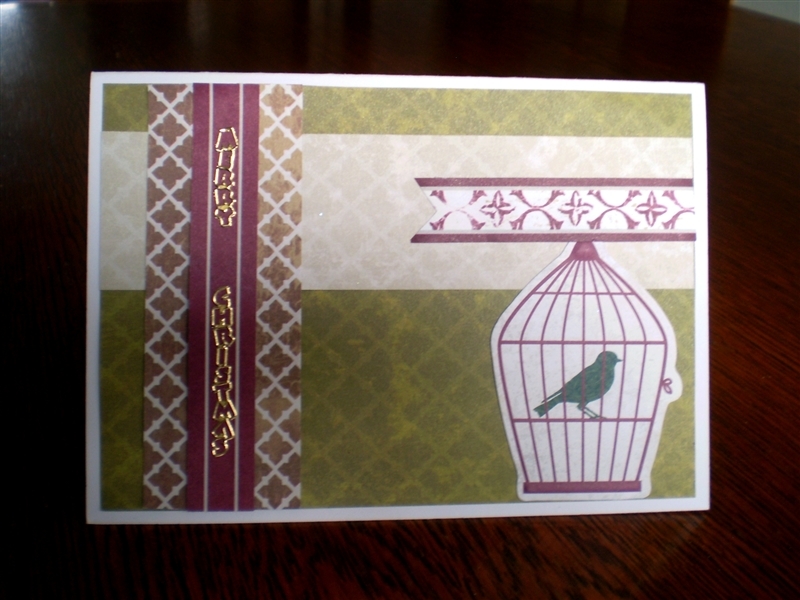 Another card with scraps and an image from my Storybook Creator. 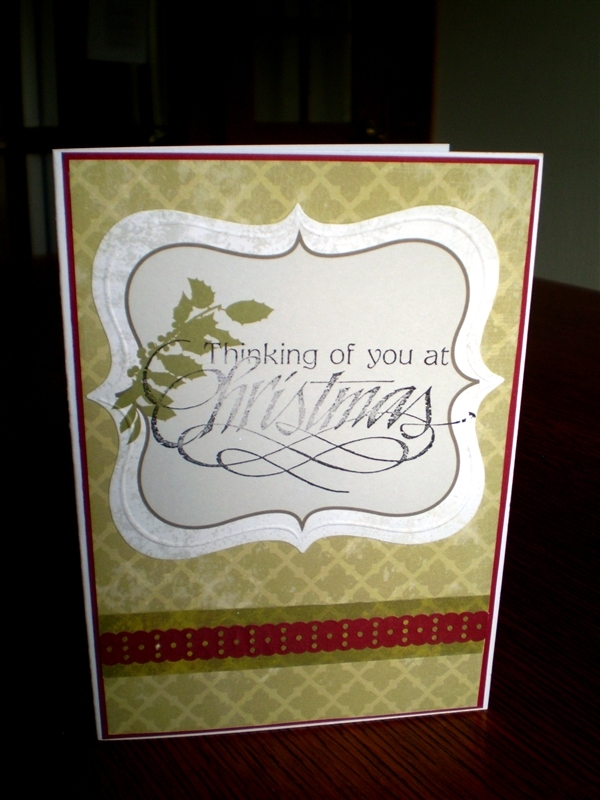 As you can see cards are so easy to make and it is great to use some of scraps. The library is a great source of information and images.